Ah Silverlake, home to some of the most interesting and eclectic eateries, shops, and people. 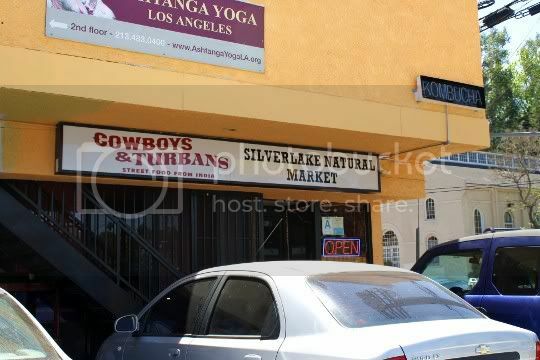 So it's no surprise that Cowboys and Turbans--nestled in a shabby strip mall--acts as both an Indian-Mexican fusion restaurant and organic homeopathy market. Although I chose to dine here, I can understand why most of the restaurant patrons coming and going were ordering takeout. This isn't the nicest place: it's not very well-lit, a bit messy, strewn with empty boxes and old freezers, and has sort of a stale musty smell. 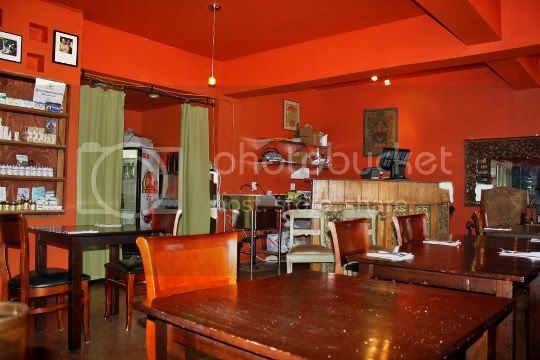 But it's homey, and the staff is super friendly and accommodating. The market itself carries lots of gluten-free, vegan, natural, and organic foods, drinks, body care items, and household products. It's thrown about and hastily organized (and most of it looks like you may want to check the expiration date), but it was good seeing certain products I'd never heard of before. 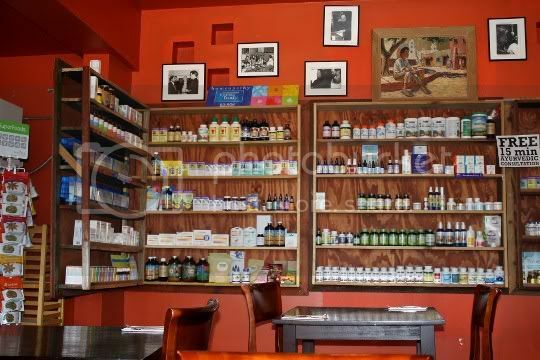 There's a wall dedicated to ayurveda, filled with vitamins, oils, and other herbal remedies. Holy hell, why has no one invented Indian-Mexican fusion sooner?!?! 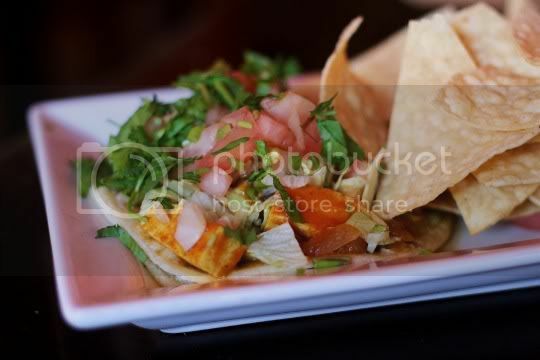 These tacos are AMAZING: mini doubled corn tortillas piled high with cubed tofu, peas, onions, tomatoes, and shredded cabbage. The tofu was heavily spiced and coated in a sweet-spicy tomato-coconut based sauce, and everything else tasted super fresh. In one bite, you've got sweet, spicy, tangy, and savory...my idea of a perfect dish. There's way too much topping on each tortilla, so they're a little difficult to eat. But that's okay, whatever falls off is just as tasty eaten with either silverware or fingers! Or, use the salted tortilla chips to scoop it up! Two of these tacos are filling, making this a great deal for the money. A giant flour tortilla stuffed with hearty chickpeas, rice, lettuce, tomato, fresh cilantro and mint, and a sweet-spicy tomato-coconut gravy. Again, why has no one done this before? 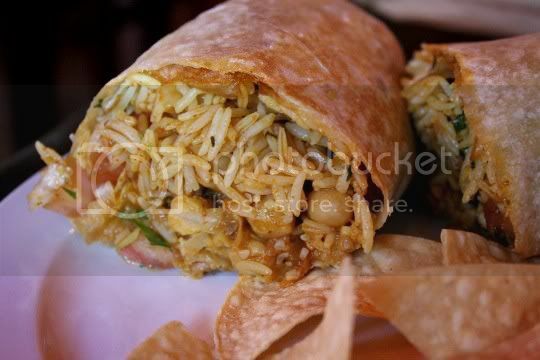 This burrito is so flavorful and satisfying, no extra seasoning or condiments are needed. The tortilla is pan fried after being rolled, so it's crisp and chewy. They went a little overboard on the rice amount, but the flavor is still so powerful and delicious. It's easily two meals worth, again making this dish a great value. So I had to order a "regular" Indian dish, just to check out this place's authenticity. Sure enough, they blew me away again. 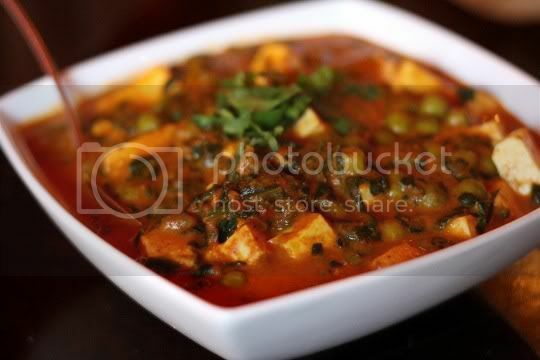 This steaming hot dish of tofu, spinach, and peas in a coconut curry sauce tasted so slow-cooked, comforting, and rich. the aroma is so intoxicating, you just want to put your head over it and breathe over and over again. It has quite a bit of heat, but again, this doesn't need any kind of additional seasoning. It's so amazing and wonderful as is. Served with a mound of basmati rice flanked with chopped tomatoes and lots of fresh cilantro, it's the perfect complement to the rich curry dish. And yes, leftovers (again, at least two meals worth!) taste even better. Cowboys and Turbans also has pizzas and quesadillas on the menu, but they were out of vegan cheese when I visited. Still, I'd love to try these...and practically anything else on the menu! Oooo...I shall have to meander into this place! He may have a few meatless options on his menu, but Baba Ji hasn't a care in the world for the well-being of the humans he employs. Not to mention all the vendors and other humans he has ripped off. Including Vegan Traders who sold him in good faith several thousand dollars in delicious vegan food. Not even a collection agency was able to recover the money. Yet his restaurant goes on. Where is there justice?